We have just released the v0.5.0 version of the Speech Devices SDK to its download site a few days ago. If you want access to it, please apply for it via the Microsoft Speech Devices SDK Sign Up Form. Please use the latest version of the Speech Devices SDK and its matching sample app. The Speech Devices SDK consumes the Speech SDK. In addition, it uses an advanced audio processing algorithm and enables a custom Key Word Spotting (KWS) feature. The Speech Devices SDK's version matches the version of the Speech SDK, so that all the APIs are consistent. Right now we only have support for Java, see the Java API reference. Please see the Speech Devices SDK’s release notes for details. We currently have one developer centric Java sample app. The source code can be found posted in the GitHub repository’s under the Samples/Android example. We will post additional Java sample apps as they become available. 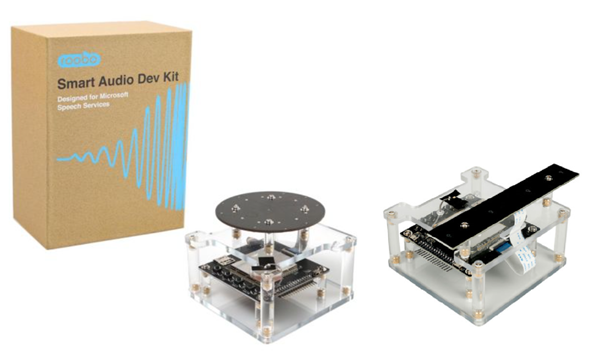 The microphone array dev kits from our hardware provider Roobo, have also gone on sale recently. Please visit ROOBO Dev Kits for Microsoft Speech Services for the hardware specs and product details. If you have questions regarding the device hardware, including ordering and shipping, please contact Roobo at rooboddk@roobo.com. Currently, they can only be shipped to the U.S. and China. Please also read the LinkedIn article about the dev kits by Xuedong Huang (technical fellow) of Microsoft Cloud & AI group. We can’t wait to see the cool devices and applications that you will build with the Microsoft Speech Devices SDK and the Roobo Smart Audio Dev Kits! For Speech Devices SDK or Speech Services questions, please visit our support page.